Overtated price - value for money ... I stayed in a dorm, 10 beds/room, Air Conditioned, crowded, value for money. Great Accessibility With a map, you can almost travel to any places in Tsim Sha Tsui. This is because the Mass Transit Railway (MTR Subway) exits are just right at the building's entrance. It can access most of the places in Hong Kong. The system is just like the subway in New York. The A21 Airport shuttle stops just within 50 steps from the entrance. Furthermore, tourists can take ferry to cross the Victoria Harbour and enjoy the beautiful sea view. Most of the transportations are greatly accessible in Tsim Sha Tsui like Train, Subway, Buses, Airport Shuttle, Taxi, Ferry, etc. Customers can travel by themselves easily. We would also suggest some famous places if you come to our reception desk. THE BEST OF ASIA!!! Best Example of Globalization in Action 'Chungking Mansions' by TIME Magazine 2007 What to see, where to eat and where to stay, Chungking Mansions could be listed under all of these categories. A Hong Kong landmark, made famous by Wong Kar Wai of Cannes fame, the mansions have become an attraction in their own right. Housed inside a maze like structure, Chungking used to be the first point of call for immigrants from every nation. 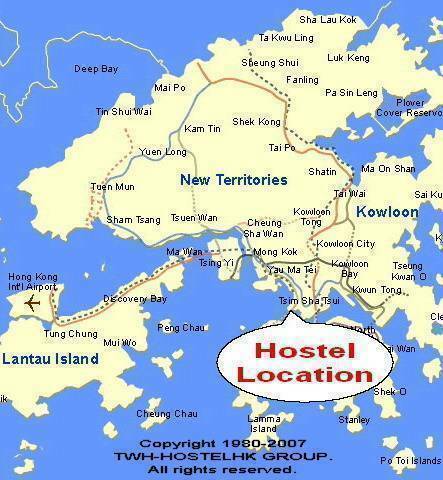 Today it is still Hong Kong's centre of multiculturialism, famous in the city for its excellent Indian and Pakistani food, while its bargain basement guesthouses and hostels have been attracting backpackers for years. Chungking Mansions is a famous building in Hong Kong, China. 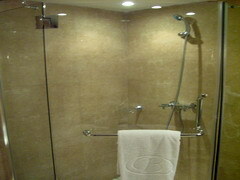 It is located at 36-44 Nathan Road in Tsim Sha Tsui. 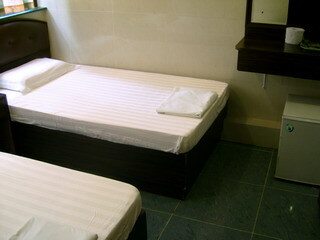 The building is well-known as nearly the cheapest accommodation in Hong Kong with a single bed of US $8 one night. Though the building is supposedly residential, it is made up of many independent cheap hotels, shops, and other services. The strange atmosphere of this building is sometimes called by some 'the scent of Kowloon's Walled City'. 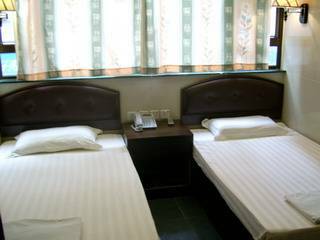 Chungking Mansions features a labyrinth of guesthouses, curry restaurants, African bistros, clothing shops, sari stores, and foreign exchange offices. It often acts as a large gathering place for some of the ethnic minorities in Hong Kong, particularly Indians, Middle Eastern people, Nepalese, Sri Lankans, Bangladeshis, Nigerians, Europeans, Americans, Pakistanis, Asians, and many other peoples of the world. The building was completed in 1961, at which time Chinese residents predominated. Now, after more than four decades of use, there are nearly 4, 000 people living in the Mansions. With this lively mix of guest workers, mainlanders, local Chinese, tourists and backpackers, the Chungking neighbourhood is one of the most culturally diverse locations in Hong Kong. In a study by CUHK anthropologist Prof. Gordon Mathews, it is revealed that there are people from at least 120 different nationalities who have passed through Chungking Mansions in the past year. In the issue of 'TIME Magazine' on May 7, 2007, Chungking Mansions was elected as the Best Example of Globalization in Action in its annual feature The Best of Asia. Pay the total amount when Check-In. Should cancel or change booking before 48 hours. Otherwise one night's fee will be charged. Once you got off the bus, turn the back way, and walk approximately about 50M, It takes about 30 seconds on foot. you can see the Chung King Mansions front entrance on your right hand side. You will see the huge TV screen paste at the wall of Chungking Mansions. When you make sure you are at Chung King Mansions, walk into the Block A ( just be close to the Chungking Mansions front entrance). You can see two lift, take the right hand side one,(stop at odd numbers floor), push the 3rd floor button, when you are out, you can see our reception should be within your sight. Taxi driver may not know precisely where Chung King Mansions is. Even if they do, they may not have heard of its name in English. If will be helpful to show them the map or Chinese word. There is no airport taxi, only regular taxis. Please catch the red colored one, because other colors do not go to the Kowloon area. Once you got off the Taxi, just find the huge TV screen paste at the wall, that just the Chungking Mansions. It should be within your sight when you got off the Taxi. 1. KCR(Kowloon-Canton Railway): If you come from Lo Wu (Shenzhen, China), please get off at the last station - East Tsim Sha Tsui. Get off from K gate - Middle Road. After comes out walks towards Nathan Road direction, walk to the intersection right extension, walk 100m, obviously Chung King Mansions main entrance, It takes about 2 minutes on foot. 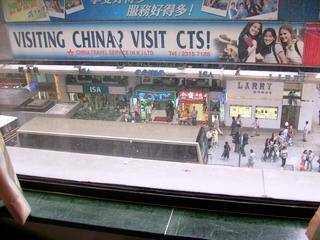 You will find the huge TV screen paste at the wall, that just the Chungking Mansions. When you make sure you are at Chung King Mansions, walk into the Block A ( just be close to the Chungking Mansions front entrance). You can see two lift, take the right hand side one,(stop at odd numbers floor), push the 3rd floor button, when you are out, you can see our reception should be within your sight. 2. Train from China Beijing, Shanghai, Guangzhou or etc...: If you take the nonstop train from Beijing, Shanghai, Guangzhou or etc... your train will stop at the Kowloon HungHom Station, when you get off the train, buy the ticket to the station - East Tsim Sha Tsui. It cost HKD$3. 5 per person, and take 2 minutes. When you arrival the East Tsim Sha Tsui station, Get off from K gate - Middle Road. After comes out walks towards Nathan Road direction, walk to the intersection right extension, walk 100m, obviously Chungking Mansions main entrance, It takes about 2 minutes on foot. 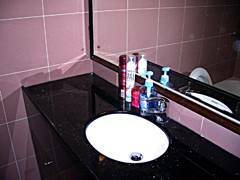 You will find the huge TV screen paste at the wall, that just the Chungking Mansions. When you make sure you are at Chung King Mansions, walk into the Block A ( just be close to the Chungking Mansions front entrance). You can see two lift, take the right hand side one,(stop at odd numbers floor), push the 3rd floor button, when you are out, you can see our reception should be within your sight. When you arrival to Hong Kong, Please do not show or give your booking information to any stranger. Because our hostel is popular, some people always stand in the street pretending to be our staff and bring you to a different place. They will try to get money out of you before you discovered that you have been cheated! Even when you find out the truth, they will not return the money to you! please make sure you are standing on the Block A, 3th floor Chungking Mansions. when you are out, you can see our reception should be within your sight. than we will direct you the easiest way to come to our hotel! Remember, the hotel is on the 3rd floor, Block A, Chungking Mansions only! Please take the "Block A ELEVATOR" straight follow to the 3rd floor by yourself!